U3O8 spot prices climbed above US$28 per pound at the start of Q1 to end the period at around US$25. Here’s an overview of the period. Sector analysts and companies see the poor U3O8 spot price performance over Q1 as the bottom of the cycle, and expect uranium to rebound over the remaining three quarters of 2019. Anticipation for the US Department of Commerce’s announcement on the Section 232 investigation into foreign uranium imports has loomed over the sector since last summer; US utilities that usually purchase from the spot market in Q1 have postponed acquisitions until the decision is passed. The absence of power companies purchasing on the spot market has kept the price low and reserves full. However, when American electricity producers do begin to purchase again, the price should be driven higher as supply dwindles. The Canadian miner is the world’s largest uranium producer, supplying 17 percent of all global demand. While the decision to halt production at the key asset has helped the spot price move upwards, it has forced Cameco to purchase out of that same market in order to fulfil contractual obligations. Shortage of supply is a concern that was reiterated at the March 2019 Prospectors & Developers Association of Canada (PDAC) convention. “Annual demand for 2019 is going to be about 190 million pounds, but last year for 2018 overall production was about 138 million pounds. But then we had secondary supplies, which are stockpiled inventories that range from 45 to 50 million pounds, so it’s been fairly balanced,” he said. This disruption is in addition to the Section 232 investigation. 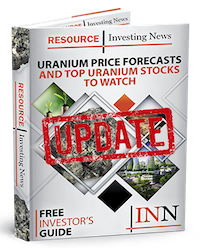 The issue around the security of foreign uranium imports was raised by Ur-Energy (TSX:URE,NYSEAMERICAN:URG) and Energy Fuels (TSX:EFR,NYSEAMERICAN:UUUU), US uranium producers concerned that imported uranium may be of inferior quality. One of the proposals put forth in Section 232 is the creation of a 25 percent domestic uranium quota. The US is the world’s largest consumer of uranium, using it to generate 1,888 kilowatt hours of electricity each year, about 20 percent of the country’s total electricity output. However, the US produces less than 5 percent of what it consumes, relying on imports for more than 90 percent of its supply.